Sentigrade is a result of a cooperation of Faculty of informatics and information technologies STU in Bratislava and PR company Seesame. It automatically analyses content published on the social network and calculates sentiment for each comment posted by users. Furthermore, data is also displayed through detailed statistics and graphs. AlefT NG (Alef: The Next Generation) is a new – upgraded version of popular e-learning system Alef. New Alef takes further steps to improve learning experience by focusing more on exercises and tests. They are enhanced by several gamification and personalized recommendation techniques. The main concept remains the same: make learning and verifying knowledge more attractive – both for students and tearchers. Design and user-interface matches modern concepts and is optimized for use on mobile devices with touch screen. Students are also able to see their current progress and interact with system by giving feedback to content. Askalot is the first educational organization-wide CQA (Community Question Answering) system. It differs from standard open CQA systems (e.g. Yahoo! 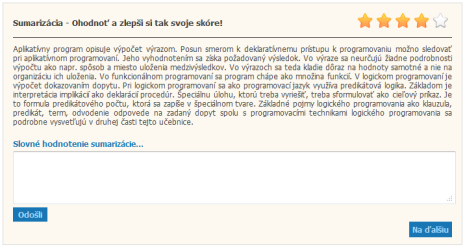 Answers or Stack Overflow) by its explicit dedication to the educational context. In addition, it differs from existing educational CQA systems by the fact that it involves students across the whole organization while existing solutions involve either an open community or too restricted community of students enrolled for the same class. Askalot provides students and teachers with: (1) essential functions necessary for question answering, knowledge sharing and collaborative learning; (2) advanced functions for an adaptive support by means of personalized recommendations. 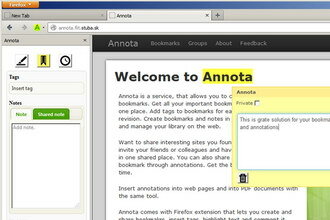 Annota is a bookmarking service for creating bookmarks and annotations in web pages and PDF files. You can create bookmarks, attach tags to them, highlight text, write comments and share created annotations in groups. Want to share interesting sites you found? Just create a group, invite your friends or colleagues and have all shared bookmarks in one place. Now you can share your bookmarks and collaboratively annotate them. The service provides web interface to manage and organize bookmarks and an extension to Firefox web browser for easy interaction with annotations. Use sidebar to bookmark pages, write notes and share them with your groups. Highlight text and write comments to save your thoughts. Add tags to bookmarks for easier search and revision. 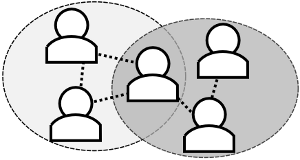 Brumo presents a browser-based distributed multi-agent collaborative user modelling and personalisation platform. 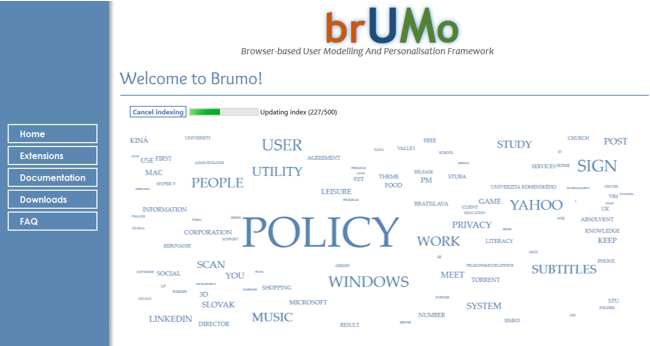 Since the main purpose is to enable personalisation of browsed web content to user, Brumo provides an interface for user model access. Via personalisation extensions, user can extend this model even further and based on gathered information about various user characteristics, user can modify content of browsed web pages to work more efficiently and comfortably. ALEF is adaptive web-based educational system built on basic three principles: (1) semantic representation of learning domain, (2) extensible personalization and course adaptation, and (3) student active participation and collaboration during learning. ALEF assembles legacy personalization techniques (adaptive navigation, tailored course presentation) with Web 2.0 key concepts (tagging, sharing, organizing the knowledge) in order to improve student performance and learning experience. We shift traditional „one-size-fits-all” learning towards collaborative learning personalized according to user actual knowledge estimated by tracking and inferring from student’s actions (based on explicit and implicit feedback) and teacher defined learning goals. Peoplia is a collaborative learning system in which a socially intelligent tutoring agent assists students with learning using pseudo-tutor assessments. 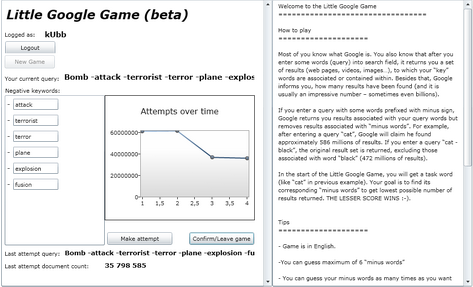 The system features free-text answering, personalized question generation, and adaptive question selection. Our experiments are directed at assessing: (1) how having a computer “as a friend” can improve motivation and learning; and (2) how the addition of a socially intelligent tutoring friend affects students’ in-class motivation and out-of-class system use. The goal is to display all publicly available information about places, villages, districts, regions and organizations in Slovakia. Using graphs and maps it displays statistics of self-government well arranged and thus creating complex tool for comparison and analysis. Project cooperates directly with the Local Government Development Center. Slovak cities and places are the other partners of this project. 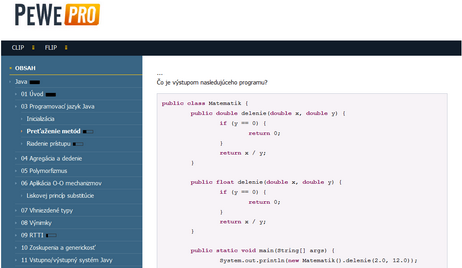 All information at NašeObce.sk is publicly available. We gained data from the following publicly accessible government portals. It works on Ruby On Rail framework. Data are regularly downloaded from publicly available sources. PopCorm, Popular Collaborative Platform, is a collaborative environment developed to support effective collaborative learning. PopCorm employs our method for creating dynamic short-term groups. The proposed method is based on students’ various personal and collaborative characteristics. Students in the created groups are able to communicate and collaborate with the help of four collaborative tools which are suitable for task solving in the domain of collaborative learning: a text editor, a graphical editor, a categorizer, and a semi-structured discussion. The categorizer is a special tool developed for solving different types of tasks the solution of which consists of one or more lists (categories). The semi-structured discussion represents a generic communication tool independent of a particular type of a task being solved. Personalized summarizer generates text summaries by extracting sentences conveying important information from the original documents. For this purpose it uses a method of personalized summarization that unlike the conventional (generic) methods considers other useful information besides the document content, such as a particular user’s characteristics (e.g. her actual knowledge) or her personal annotations (highlights). It utilizes the relevant terms from the domain conceptualization as well. The summarizer is implemented as a web service and is capable of summarizing texts in many languages independently of the chosen domain. We have integrated it with the adaptive web-based educational system ALEF where it provides summaries of educational texts for students. There, it can be used to help them decide whether the educational text is worth reading or to help them revise before test or exam. Try Personalized Summarizer in ALEF now! 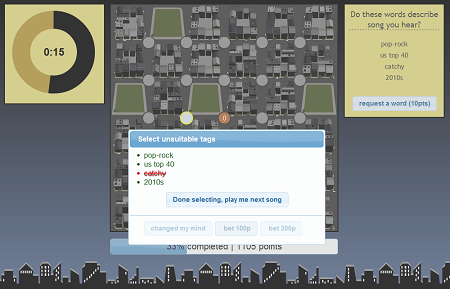 CityLights is a web game, where players (by their actions) validate sets of music annotations fetched from public datasets. They are presented with couple of sets of annotations and a song. Their task is to guess which of the presented sets contains annotations for song they are hearing. The goal is to go through pregenerated path with minimum of wrong guesses. Players by their actions unknowingly validate individual song-annotation relationships and help us to get rid of unsuitable or too subjective annotations. PexAce, as a game with a purpose, is a variant of the popular memory game Pexeso where players need two find two same cards on the playing board by subsequently uncovering pairs of cards. In PexAce, we allow players to enter short textual annotations to cards, which help them recall card positions and thus finish the game faster and score more points. We process these annotations via multiple player agreement principles and thus contribute to multimedia metadata authoring by acquiring metadata describing the presented images. Adaptive proxy is an enhanced http proxy server, delivering personalized and social surfing experience on the open and “wild” Web. It incorporates open corpus keyword-based user modeling, various approaches to virtual communities detection and personalizing services, which are, for instance, able to improve your web-based searching or navigation within complex web sites. Adaptive proxy is an open-source platform with architecture based on plugins and services. As such, it is an ideal platform for evaluation of bachelor, master and dissertation theses dealing with Semantic, Adaptive and Social Web. It can host your project too! A simple web search word game – players minimize the number of results returned by a search engine using a special format for queries (example: “jaguar -animal -car -cat -company”) consisting of a given task word (“jaguar”) and “minus words” (“-animal -car -cat -company”), which are guessed by the user. The game logs are further analyzed and a taxonomy of terms is constructed. The key idea of taxonomy construction is that successful game queries have to contain “minus words” related to the task word. HladnýŠtudent.sk is a website (in Slovak) for all hungry students and everyone who wants to choose something good for lunch. It contains daily menus for all major student canteens in Mlynská Dolina and some basic information about the canteens like the opening hours and the location on the map. The application runs on Ruby on Rails framework and the canteens’ homepages are automatically parsed every day to keep all the information updated. We plan to add more canteens from different regions and the users can suggest their favourite ones using a form at the bottom of the page. We have even more plans for the future, such as a mobile version, meal rating or favourite meal notification. Memotion is innovative and unique photo album visualization, which is used for events recall, recognition and for a navigation through the photo album. We follow the fact that in most cases photography is considered to be a medium to save and share memories and emotions from photographed events. 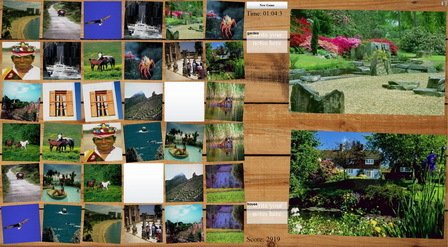 Our visualization intended to enhance positive user experience while browsing photo albums. Try Photo Album Creation now (video show)! Try Photo Album Browsing now (video show)! In cooperation with largest Slovak online news portal (~1M visits/day) we present collaborative recommendation engine for news and blog articles. Our approach includes novel recommendation techniques such as negative implicit feedback from server logs and linearly scalable top-k nearest neighborhood-based recommendation algorithm. We are currently processing and recommending from a stream of ~200MB raw logs/day. Zoom-based navigation is concept of view-based navigation on the Semantic Web by zooming trough hierarchy of adaptive views on resources. This concept of navigation respects all phases of users’ navigation on the Web – from support of desired result identification by hierarchical clusters view of faceted browser results, to browsing of similar and related resources (results) by graph views on resources and their relations. Intensity Relationship Analyzer & Presenter realizes our method for analysis of relationships intensity. 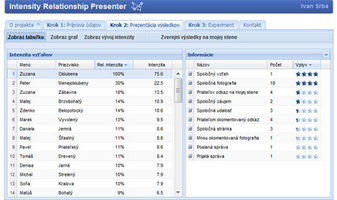 It allows users to calculate intensity strength of their relationships to selected friends and simply browse results. It is developed for social network Facebook and can be used by any Facebook user. WebImp improves the structure of the FIIT website by adding new sections to it. These sections include personalized links to news and events which interest the visitor. 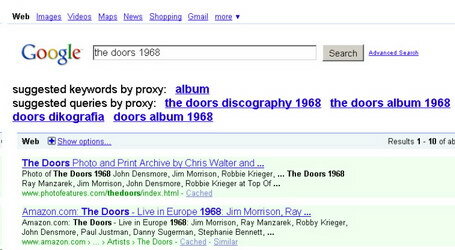 They also include recommended links which other similar users found interesting. Personalization is based on user’s behavior and actions taken while surfing the website. Try it and you will never miss an interesting event or a piece of news again. In order to get personalized FIIT site, you should set the adaptive proxy in your browser. Bifrost helps you search faster by automatically recommending a set of search queries that match your interests. Your interests are inferred from logs of your Web activity, and enhanced with data from people, whose interests are similar to yours. 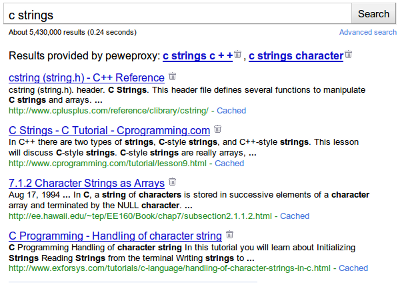 In order to get personalized search results, you should set the adaptive proxy in your browser. We use similarity among articles which is used to hierarchically sort these articles. Hierarchy is built incrementally as far as new articles are published. We extract keywords from each article to be used in the hierarchy. Method is then able to search for similar articles in the hierarchy of the articles. This searching is logarithmical, so it is effective even for big dataset of articles. Readers are monitored using action logging. Everytime user displays an article, system stores this action. Actions represents the interest of specific user. We are able to map each article displayed by the user onto nodes in the hierarchy. User normally reads articles which are close. Majority of articles are similar in the fact. This is how we locate interests which were covered. Other articles, which could be interesting are stored nearby in the hierarchy. Method is used to pick few of articles, which are sorted using time relevancy. Watch Trecom in action now! Factic is and advanced faceted semantic browser devised to enable Adaptive Social Semantic Web exploration by providing personalized faceted browsing, user interface generation, visual query construction and graph exploration. 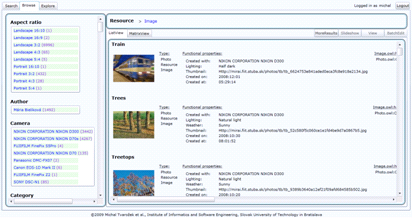 PhotoBrowser is an advanced web-based photo viewer, which allows users to explore photos stored in a Semantic Web repository. It allows users to view images, use slideshows and perform simple operations such as zooming, panning and rotation. 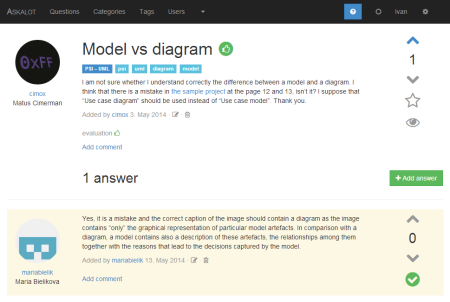 GraphViz is an graph exploration tool for Semantic Web exploration. It allows users to view a specific resource and its neighbors, move the visible information space window or expand individual nodes. For improved usability standard interaction options such as zooming, panning or node hiding are available. 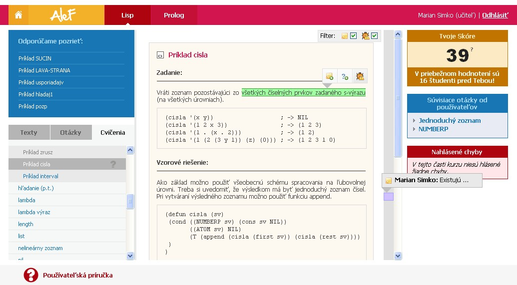 Flip is in adaptive educational system for learning of programing in various languages (e.g., Java or Lisp). Learning material and question recommendation is adaptive based on user knowledge estimation via Item Response Theory (ITR). Note: Use your AIS login for system access. Suggester is aimed at increasing user satisfaction with the result list returned from Google using implicit relevance feedback. We gather clicks on results in the result list, detect the query reformulation and search for relations in entered keywords. It works using proxy. After proxy setup, the browser redirects search requests for Google to our proxy. It processes the query and forwards it to the Google. A response from the Google is sent back to our proxy, where it is evaluated and modified according to previously gathered implicit feedback. After that, the resulting list page is sent back to the user’s browser. Proxy is not used for any other pages the user visits. 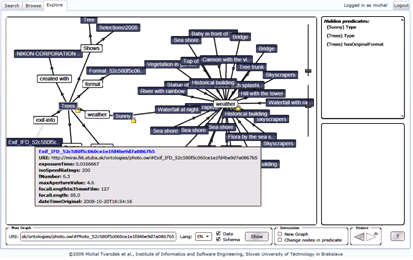 Metallurgy is a text metadata extraction web service. 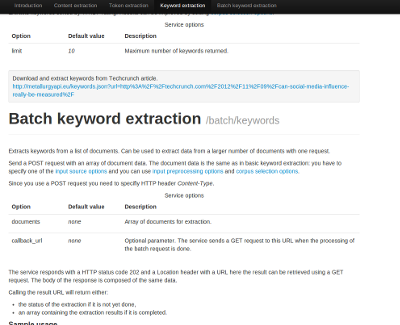 It provides fast multi-language keyword extraction and content extraction (ala readability). Metallurgy also supports batch requests.